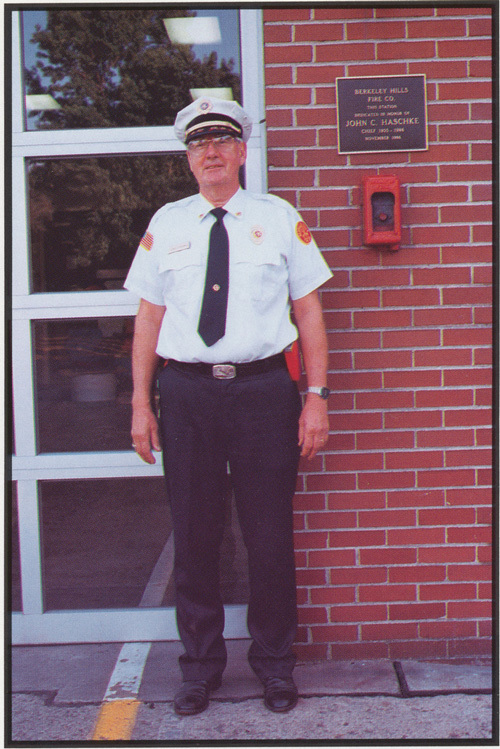 Chief John C. Haschke retired as Fire Chief of the Berkeley Hills Fire Company in 1986. This ended his brilliant leadership as Chief which had lasted 32 years. The Fire Company unanimously voted to give John Haschke the honorary title of "Chief Emeritus". On October 10, 1986 a special retirement dinner was held at our fire hall to honor Chief Haschke for his 38 years of unselfish service to the community and his 32 years as our Fire Chief. After his official retirement, Chief Haschke continued to serve the company and community as a mentor to younger members, a trusted advisor to current officers of the company, and contributor to several special committees. He was a regular at the station, sharing his stories and experience, until his passing. The company is honored to have had such a dedicated and passionate leader and member for so many years, and will always remember the countless contributions that Chief Haschke selfishly gave of himself.